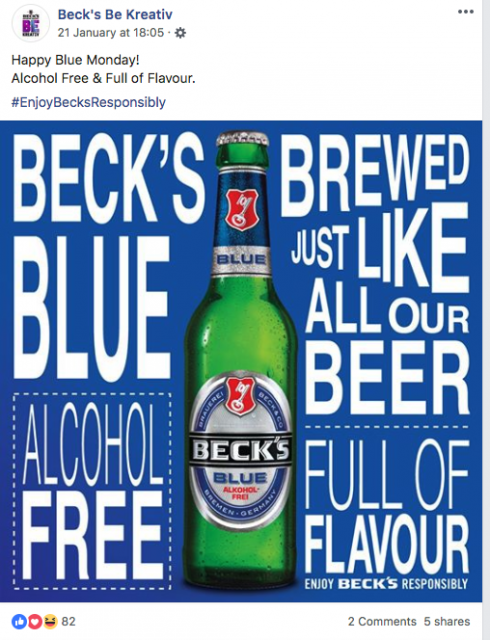 AB InBev owned Beck’s launched the Beck’s Blue Monday campaign last month, offering consumers a free non-alcoholic beer redeemable in selected pubs and bars across the UK. The campaign ran in partnership with over 1,000 Mitchell and Butler locations, helping to drive footfall during the quietest month for the on-trade. Blue Monday, this year falling on 21 January, is known as the gloomiest day of the year. Rory McLellan, on-trade sales director, AB InBev UK, commented: “When speaking with our partners we often hear the same concerns: after a busy Christmas and New Year’s, pubs struggle to get people though the door in January. We wanted to create a fun campaign that would help the on-trade boost footfall while also being mindful of consumers’ growing appetite for abstinence and moderation. Anna-Marie Mason, director of brand marketing at Mitchell and Butlers, said: “At Mitchells & Butlers, we aim to make everyone welcome, whether drinking alcoholic beverages or not. We also know January is a key period for moderation and, we want to help our customers with their goals.